I've been doing a bit of an experiment with an alternate Twitter account and News.me. I am very particular when it comes to Twitter and who I follow. I don't want too much nonsense and I try to follow people and companies of interest. I've gone through many "unfollows" removing junk and people I found over time not to satisfy my interests. Currently, my follows and list are pretty well tuned to exactly what I want, so the books are mostly closed for adding more. On the other hand, I have an application Twitter account (@twixmit). The original idea for this account never really took off, the hope was that people would authorize their Twitter accounts to be randomly posted to with something someone else said (mixing). But nobody wants to do that. The site has a demo, but I am not even sure people understand the objective, and if it has to be explained, then it isn't designed well in my opinion, so I will spare you the details. So, I thought I'd use the account for something else, over following and News.me participation to see what fell out. 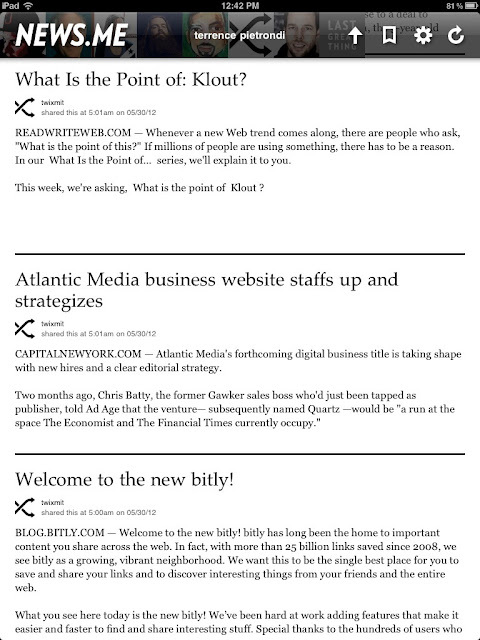 Now the account is used to pull News.me user digests and post the links every few hours. The account also follows the users that is scrapes from (and other junk accounts, more later). Strange people follow the account, so I follow them back, I don't really care who I follow because I don't read the stream. I am more interested in getting the numbers up. I suspect I get follows due to interest in the links I post, other times, I think people just want a reciprocal follow, which I give. I also think most News.me users follow each other, so there are plenty of duplicate articles across the digests. I'm torn over whether being shared more or less is better, sometimes I really enjoy the obscure article. Maybe I will add a link counter and only post on high and lows, but right now its just everything (I avoid duplicates given a URL, but sometimes the same things are posted twice). The account also makes for good following in the News.me app, basically summarizing the over following on the account and getting the selected articles. With all the random weirdos and the News.me follows, it makes for a good blend. How about some code? Sure, its on Github and runs on the Google App Engine: newmedigester.py. 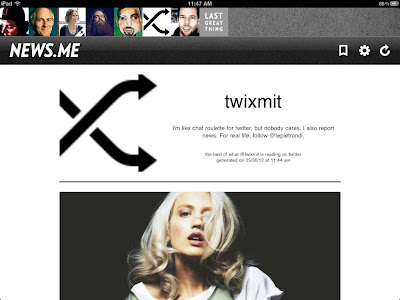 Twixmit has Klout too.